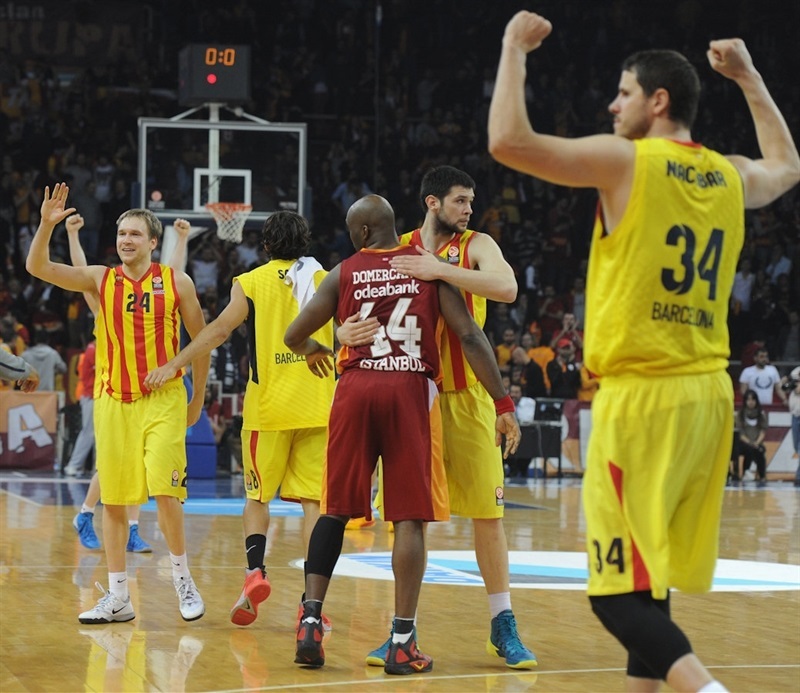 Marcelinho Huertas kept FC Barcelona in it till the closing minutes and Joey Dorsey and Brad Oleson each came up with key defensive plays and free throws to wrap up a 75-78 victory over Galatasaray Liv Hospital at Abdi Ipekci Arena on Sunday, a sweep of their Turkish Airlines Euroleague Playoffs series and the first ticket to the 2014 Final Four in Milan, Italy. Barca will take part in its fifth Final Four in six seasons, but it was not an easy task at all. Galatasaray led by as many as 10 in the first quarter and despite Huertas’s heroics, a 9-1 run highlighted by a Carlos Arroyo three gave the hosts a 70-68 lead inside of two minutes. After Dorsey split free throws to give Barca the lead, he came up with a brilliant block on Arroyo. Then Oleson added another free throw before stealing Galatasaray’s inbounds pass and icing the win from the line. 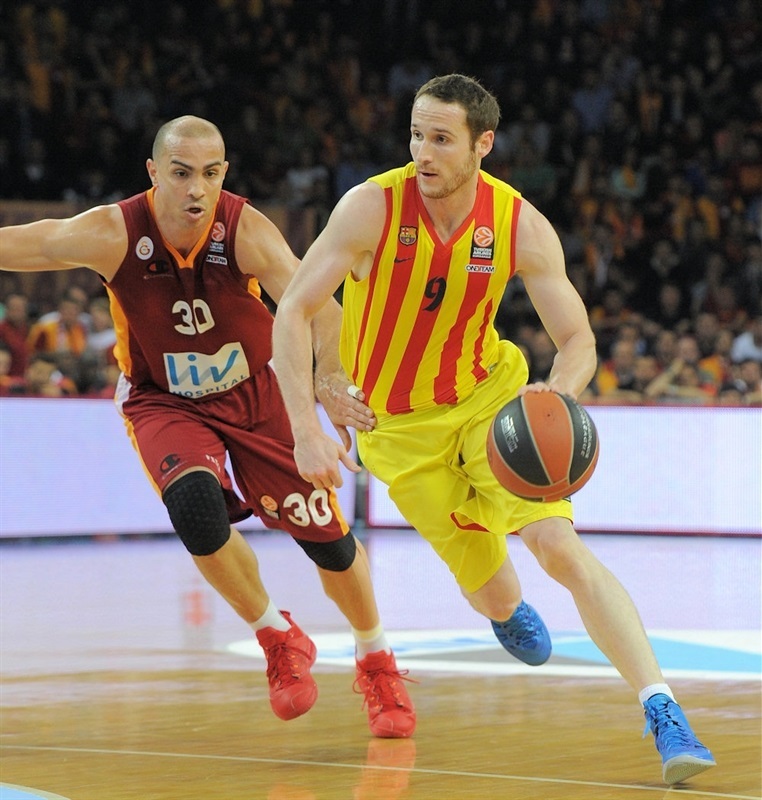 Huertas paced the Barcelona attack with 16 points and Oleson finished with 13 points. Arroyo, back from an ankle injury that cost him Game 2, tallied 21 points in defeat. 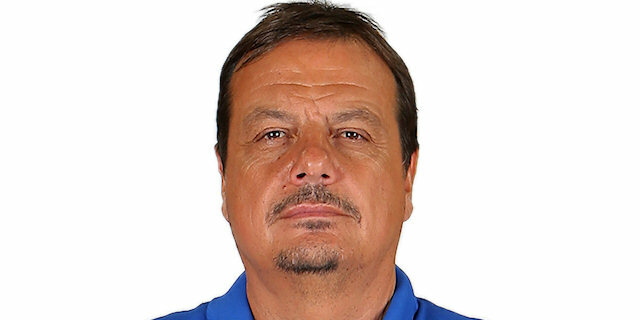 Zoran Erceg added 19 and Milan Macvan 11 in defeat. Barcelona won the opening tip and scored first when Erazem Lorbek split free throws 10 seconds in. The big man soon added 2 more thanks to a Kostas Papanikolaou steal. Erceg got Galatasaray going with free throws. The hosts took their first lead on a Manu Markoishvili three-pointer. Brad Oleson tied it at 7-7 as the teams stayed close. Ante Tomic found a wide-open Papanikolaou for a three, but Erceg matched him with a three from the corner. Furkan Aldemir brought the crowd to its feet with a two-handed fast-break slam. Arroyo fed Aldemir for a second straight slam to put the hosts up 16-11. Bostjan Nachbar fed Maciej Lampe for a score underneath, but an Arroyo triple kept the home team cruising. The lead was 8 after Erceg free throws. Victor Sada missed a layup on the break and Galatasaray capitalized with Arroyo making it a double-digit gap from the line. Sada free throws made it 23-15 through 10 minutes. Baskets by Lorbek and Jacob Pullen quickly halved Barcelona’s deficit. 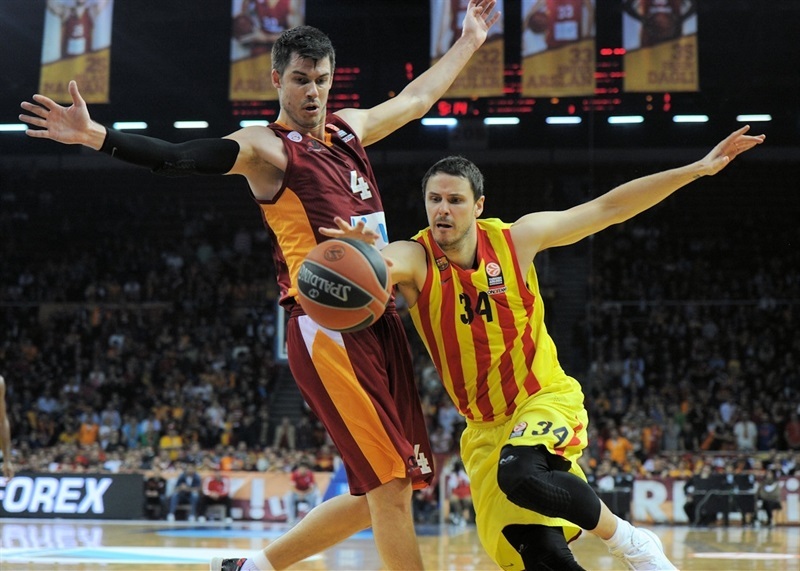 Macvan revived the hosts with free throws, but Barcelona tore apart a Galatasaray trap for a Sada layup. The pace remain rapid with Macvan draining a three before Pullen penetrated. Sada trimmed the difference to 28-25 on another Sada layup. Ender Arslan’s floater off the glass and an Erceg bucket in the paint restored a more-comfortable lead for the hosts. Nachbar hit back from downtown to make it 32-28 midway through the quarter. Pullen banked in a three and Tomic and Nachbar teamed up to stop Malik Hairston inside after the Galatasaray forward fought for a pair of offensive rebounds. Oleson free throws brought the visiting team within 1. Erceg and Lampe traded points. 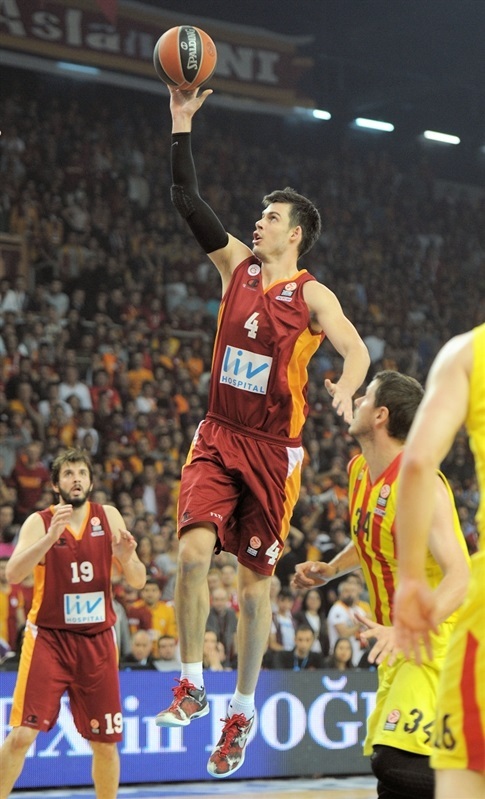 Markoishvili sank a three over the outstretched arm of Lampe to give Galatasaray a 40-35 lead at the break. Aldemir split free throws and Oleson nailed a jumper to start the second half. Tomic converted inside to bring the visitors within 2. 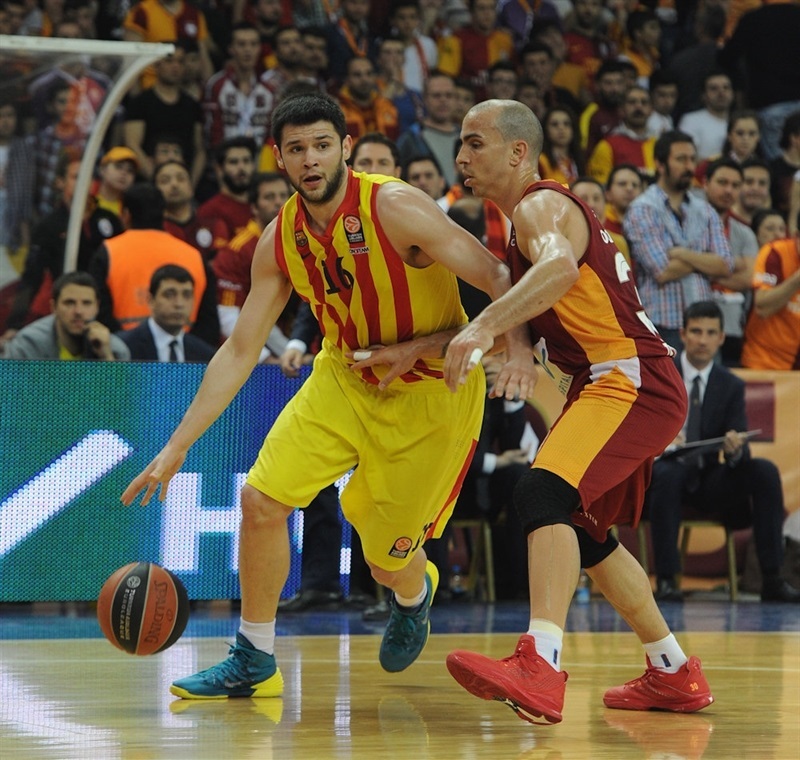 Erceg scored a tough runner to keep Galatasaray ahead, but Nachbar countered with a basket-plus-foul. Hairston scored his first points of the game from the line. A baseline drive from Nachbar was followed by a tough Arroyo jumper to make it 47-44 midway through the quarter. Tomic scored in the lane before the TV timeout. After Macvan free throws, Alex Abrines tied the game at 49-49 with a three-pointer. Arroyo responded from downtown for the hosts. Huertas sank a floater and a jumper to put Barcelona up 52-53. Arroyo went around Huertas for a three-point play as the hosts regained the lead. Tomic took a seat with 4 fouls. Abrines tied the score at 55-55 with free throws. Huertas penetrated to put Barca back in front, but Erceg tied it. Huertas drilled a three from the top of the key to make it 57-60 and followed that up with a layup. After a timeout, Arroyo fired in a three-pointer. Oleson scored, Joey Dorsey blocked a shot on defense and Lorbek nailed a triple to give the visitors a 60-67 lead midway through the quarter. Aldemir came off the bench and dunked on his first touch. Hairston split free throws with three minutes remaining to bring the hosts within 4. Then Erceg free throws made it 65-67. Arroyo completed the comeback with a three with just under two minutes left that made it 68-68. A mixup on the Barca attack left the ball with Markoishvili, who capped a 9-1 run with an uncontested layup. 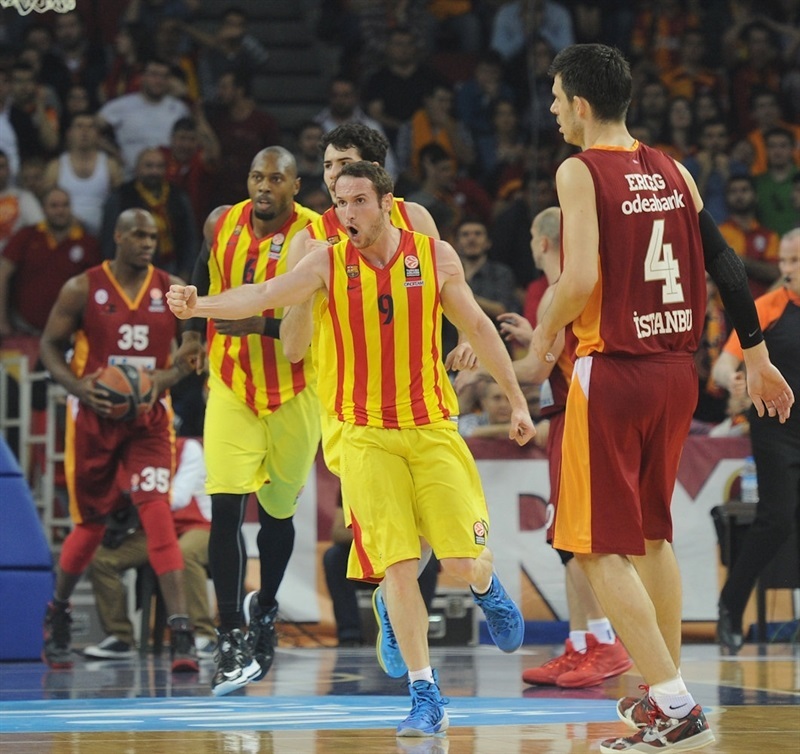 Huertas tied the game with a short jumper; Hairston did the same for Galatasaray. Huertas remained the go-to guy for the visitors as he banked in a floater to tie the game at 72-72 in the final minute. After Arroyo missed a jumper, Dorsey split free throws with 23 seconds remaining. Dorsey then rejected Arroyo with 15 seconds left. Oleson split free throws with 10.5 second to go to give Barcelona a 2-point cushion. Oleson then stole the inbounds pass, drew a foul and iced the game with free throws with 9.1 seconds left for a 72-76 lead. Macvan gave Galatasaray hope with a three with 2.6 seconds remaining, but Oleson again sank free throws and Markoishvili’s prayer at the buzzer fell short. "We've played good basketball; especially in the first half I can say we outplayed Barcelona. We attacked on pick-and-rolls and got it done like we wanted to in the first 20 minutes. But it's tougher to score in the second half. We just scored just 12 points in the third quarter. We turned the ball over easily and missed open shots. I think we made a few mistakes defending Huertas and he punished that by scoring in the crucial minutes. Despite everything, we had our chances to win the game in last 50 seconds, but couldn't figure it out. Barcelona also punished our mistakes and won the series 3-0. It was like a marathon with 27 Euroleague games this season, and we proved to people that we're a team that deserves a spot in the quarterfinals." "We're very pleased with this accomplishment. This is our fifth Final Four in six years. I want to congratulate my team for this performance. They had a good night. Also it was an excellent game for the fans. It was a close game at the end and both teams could have win. 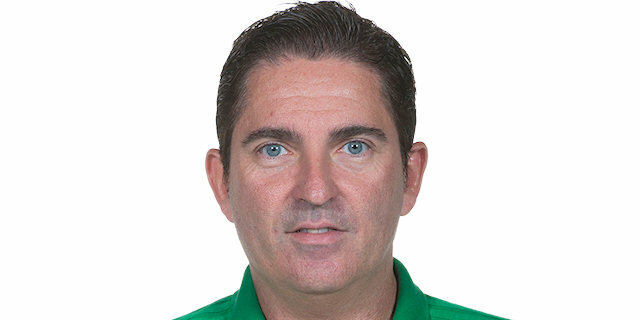 We defended well in the last positions and qualified to the Final Four."